If you attend networking events, you’ve probably realized how important an elevator pitch is. Having a nice, succinct speech about your organization’s mission can make a big difference in your networking efforts. An elevator pitch is a short, persuasive snippet of information about your business. Called an elevator pitch because you should be able to give the entire pitch during an elevator ride. Most people estimate that to be about 118 seconds, the average length of an elevator ride in New York City. This doesn’t mean that your elevator pitch should be exactly 118 seconds (almost 2 minutes), but that it shouldn’t be any longer than that. Why are Elevator Pitches so Important For Nonprofits? As a nonprofit, you rely on donations, volunteers, community engagement, and public interest to operate. A good elevator pitch costs nothing but can help you secure all of those things. When someone asks the age-old question, “What do you do?” they’re giving you the chance to talk about the incredible work your organization does. You only have a minute or two to get your point across. You can make a big impact in a short time, but you want to make sure it’s a positive impact. How can you do that? 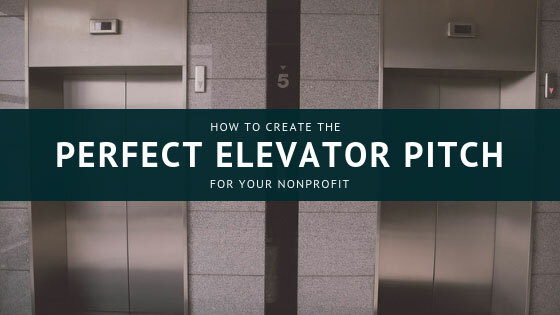 What should a good nonprofit elevator pitch look and sound like? Because elevator pitches are short, they require careful planning. That includes dividing up the information you want to share and expanding on it at just the right time. They follow a particular structure to maximize effectiveness: hook, body, wrap-up. This is the first part of your pitch and it should catch your listener’s attention. Don’t bother with small talk, just introduce yourself and your position. Add in one sentence, perhaps adapted from your mission statement, about your organization to give them a better idea of what it’s about. You’ll go more in depth in the body of your pitch so one sentence is plenty right now. This is your opportunity to expand on the information you gave in the hook. Tell your listener what makes your nonprofit special, who your work impacts, and how effective your work is. Use specifics to make your point. This is your opportunity to wrap everything up nicely and make a specific ask. Before you even start your pitch, you should know what you’ll be asking. Do you want your listener to donate, share your nonprofit on social media, sign up as a volunteer, or something else entirely? Keep in mind that this is an elevator pitch and an invitation to become part of your organization, not a solicitation. You don’t want to be pushy. A great elevator pitch is more than the sum of its parts. You have to know how to put the pieces together to create an effective pitch. Here are our top three dos and don’ts for perfecting your elevator pitch. Practicing your elevator pitch ensures that you’re within the recommended timeframe and that you can deliver your pitch confidently. Reading your pitch out loud will help you identify any parts that are tricky to say and allow you to rework them before going “live” with your pitch. Rehearsing also helps you make sure you sound natural every time. It shouldn’t sound like you’ve memorized it and you shouldn’t be reading from index cards. It’s ok to commit the main points to memory, but use the rest of the pitch to inject your own personality and let your passion shine through. You’ll instantly sound more genuine. Instead of talking to your mirror, try practicing with other members of your organization so everyone has the opportunity to perfect their pitch. Who does your work impact? Why should your listener care about your organization? Just be careful not to overwhelm them with examples. There’s no need to share every success you’ve had over the past year, just one is enough. If you have your business cards, it’s a great idea to give your listener one after you’ve wrapped up. This ensures they have your contact information if they want to speak further, get involved, or make a donation. If your elevator pitch is so full of jargon and industry-speak your listener can’t understand it, they’re likely to tune you out. Your pitch should be conversational and use plain language, not loaded with words the layperson can’t understand. Similar to not using jargon, you shouldn’t assume that your listener is familiar with your cause. The assumption that you can be vague because your listener knows what you’re talking about is a foolproof way to deliver a lackluster elevator pitch. When someone asks, “what do you do?” it would be easy to rattle off a list of the things your organization does. Reciting a list is a succinct way to answer the question, but isn’t very intriguing to listen to. Instead of listing everything you do, use this opportunity to explain a few key things your nonprofit focuses on.